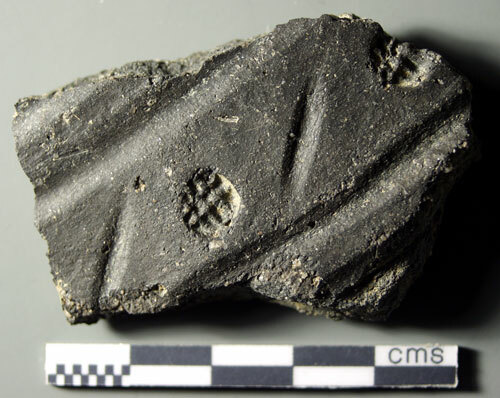 The Archive of Anglo-Saxon Pottery Stamps (AASPS) covers the period usually referred to as ‘Pagan Saxon’, but in fact stamps continue to be found in contexts as late as the early eighth century, although the peak period is the late fifth to early seventh centuries. The first recognition that the same stamps could be associated with a number of pots was made by Professor J.N.L. Myres and published in Antiquity (Vol XI) in 1937. The Archive was started in 1980, as a result of suggestions by Tom and Margaret Jones (1916-2001), who had discovered an easy, cheap and reliable way of recording stamps on the Anglo-Saxon pots at Mucking. Prior to this, Teresa Briscoe (1918-1995) had already compiled an illustrated Card Index, which she had started in 1951 and based on excavation reports. This project was the result of the first ever stamp-orientated excavation report for an Anglo-Saxon Cemetery, published by Tom Lethbridge (1901-1971) in that year. As the discoverer of the Lackford Cemetery in 1945, Teresa Home (as she was then) took part in the initial excavations, and became interested in the shape and form of the stamps on the pots being recovered. It was at the suggestion of Tom Lethbridge that she started to re-draw and study the stamps, first from Lackford and then from subsequent reports. The Lackford cemetery site forms a watershed in the study of Anglo-Saxon pottery, as up to that time, pots were poorly illustrated or ignored unless whole, decorated or considered unusual. The 1947 excavation was carried out after a second deep ploughing of the site, and under what today would be considered insuperable difficulties. At that time, petrol and funds were unavailable, as was paper for publication. To add to these problems, the site was two kilometres from any road – so all equipment and the recovered pots had to be carried to where the cars could be parked each evening, and then taken back to Cambridge (about 25 miles/40 kilometres away). Because of the attitude to Anglo-Saxon pottery which had been the norm until this time, vast numbers of sherds from the site, which would now be kept and catalogued, were ignored, so that this site represents the meeting of the old and the new techniques. Iin order to compile the card index, it was necessary to work out a classification of the motifs, so as to be able to retrieve stamps without difficulty. When the Jones approached the British Museum with the idea of an Archive, because of her previous work, Teresa Briscoe was asked to expand her operations to include the new casts. Initially all the motifs came from Mucking. The aim of the Archive is to produce material for comparison between sites which may be far apart, in order to discover any patterns in distribution that might lead to more information regarding the early A.S. settlers, their movements, trade patterns and perhaps even their religious beliefs. The other object is to provide information, and to submit reports on stamps from sites when requested to do so. Since its beginning, the Archive has collected nearly 13,700 casts and index cards for individual pot stamps from all over England. In addition to this, there is firstly an Card Index list recording stamps identified from reports (i.e. where casts are not available due to various circumstances, or the pot or sherd has been lost). Secondly there is Professor J.N.L. Myres’ illustrated card index and Corpus of the stamped pots, with 1,556 records; thirdly there is a collection of impressions taken in Europe by Dafydd Kidd, numbering 468 items, plus impressions from various other sources. 1. SITE LISTS: These are lists of the stamps found at a specific site. These combine material from the site lists, organised by stamp type, so that it is possible to get an overall picture for the whole country for a specific motif (e.g. A5fv). Information can be extracted on a variety of parameters. We can also produce lists for sites or areas, organised by stamp type. The Archive is available to all archaeologists and students working in this area for consultation and reference. In addition reports are made on any material which is submitted to us. Reports are also written on stamps which have been submitted, for inclusion in the Excavation Reports. Information has also been sent by letter to inquirers from the Continent. The Archive is housed at present in West Hampstead in London, and is available to anyone who would like to visit it or who wishes to consult it, in order to compare material. West Hampstead is on the Jubilee tube line, the London Overland and the Thameslink. Research into old publications of sites has been carried out and we have acquired photocopies of the relevant material. This, with the large library of books on the period which have been accumulated, offers a reference library in addition to the casts for consultation. My PhD Thesis on ‘The Stamped Wheel-turned Pottery of Fourth Century Britain and its Relationship to the Stamped Hand-made Pottery of Britain from the Post-Roman Period’ was examined and approved in 2015 and is lodged at University College London. I am currently updating the database with items discovered while I was working on the PhD, but then intend to return to doing some further analysis on the AS stamps. It has become evident that the distribution of pot stamps has a bearing on tribal and family groups. It is hoped to be able to trace this back, ultimately, to continental sources. Although the casts in the Archive are almost exclusively from the Pagan Anglo-Saxon period, information on, and some casts of, Iron Age, Celtic and Early Medieval stamped pottery are included when these are sent to us, but are labelled for the different periods. Stamped pottery of the Roman period is included in the ARPS (see the link to the right of this column).